Section 578 of Public Law 106-65 of the National Defense Authorization Act (passed January/2000 ) mandates that the United States Armed Forces shall provide the rendering of honors in a military funeral for any eligible veteran if requested by his or her family. As mandated by federal law, an honor guard detail for the burial of an eligible veteran shall consist of no fewer than two members of the Armed Forces. One member of the detail shall be a representative of the parent armed service of the deceased veteran. The honor guard detail will, at a minimum, perform a ceremony that includes the folding and presenting of the flag of the United States to the next of kin and the playing of Taps which will be played by a lone bugler, if available, or by audio recording. We do have an appropriate area for this ceremony in most of our departure locations. 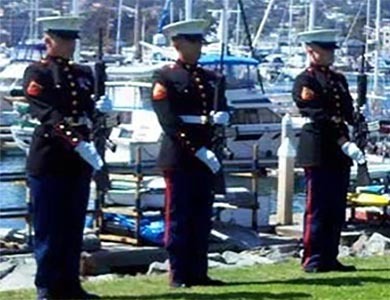 Check with our booking person to ensure an appropriate area is available if you would like military honors performed. 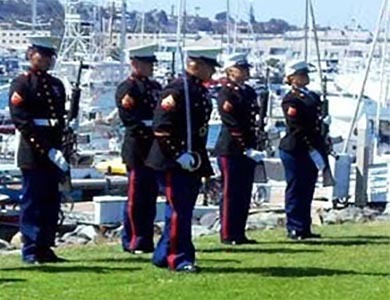 The Marines are the only branch of the military which supply a person who actually plays the bugle. all the other branches have a person with a bugle, but they are not actually playing the bugle – it is a recording that plays. We do much prefer the live bugle player, so we try to use the organization “Bugles Across America“. They are a national 501C3 organization who provide live buglers free of charge to veteran families for the playing of taps at military honors services. The Military Honors forms, for the appropriate branch of the service, are below. They should be completed and send to the appropriate address, so the military may make appropriate preparations. If you wish, we could make the arrangements for you. The flag is folded 13 times and each fold has a meaning which is described below. We assist many families all the time who have military honors – it is very special for the family. Your facilitator will be happy to take pictures with your camera of the honors ceremony. It is usually performed before the ash scattering service on the yacht. We have a large grassy area near our departure point the serves as a perfect location for the flag folding. Arrangements can also arrange to have special music played live at the occasion. Perhaps a bagpipe playing Amazing Grace. When the flag is presented to the family member, slightly different verbiage is used, depending on the branch of the service the veteran served in. 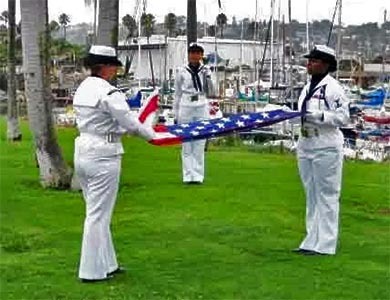 On behalf of the President of the United States and the Chief of Naval Operations, please accept this flag as a symbol of our appreciation for your loved one’s service to this Country and a grateful Navy. On behalf of the President of the United States, the Commandant of the Marine Corps, and a grateful nation, please accept this flag as a symbol of our appreciation for your loved one’s service to Country and Corps. On behalf of the President of the United States, the Department of the Air Force, and a grateful nation, we offer this flag for the faithful and dedicated service of (service member’s rank and name). On behalf of the President of the United States, the Commandant of the Coast Guard, and a grateful nation, please accept this flag as a symbol of our appreciation for your loved one’s service to Country and the Coast Guard. The thirteen fold procedure evolved as a means of providing religious significance to the ceremony and its participants. It is often requested to be read alongside the folding of the flag at funerals. The meaning of each fold is described below. The second fold of the flag is a symbol of the people’s belief in the eternal life. The third fold of the flag is made in honor and remembrance of the Veteran departing ranks who gave a portion of life for the defense of the country to attain peace throughout the world. The fourth fold of the flag represents the people’s weaker nature. For as American citizens trusting in God, it is to Him the people turn to in times of peace as well as in times of war for His divine guidance. The fifth fold of the flag is a tribute to the country, for in the words of Commodore Stephen Decatur, “Our country, in dealing with the other countries, may she always be right, but it is still our country, right or wrong. The sixth fold of the flag is for where people’s hearts lie. It is with hearts that people pledge allegiance to the flag of the United States of America, and to the Republic for which it stands, one nation under God, indivisible, with liberty and justice for all. The seventh fold of the flag is a tribute to the Armed Forces, for it is through them that the people protect the country and flag against all enemies, whether they be found within or without the boundaries of the Republic. The eighth fold of the flag is a tribute to the one who entered into the valley of the shadow of death, that people might see the light of day, and to honor one’s mother, for whom it flies on Mother’s Day. The ninth fold of the flag is a tribute to womanhood, for it has been through their faith, love, loyalty and devotion the character of the men and women who have made the country great molded. The tenth fold of the flag is a tribute to father, for he too, has given his sons and daughters for the defense of the country since he or she was first born. The eleventh fold of the flag, in the eyes of Hebrew citizens, represents the lower portion of the seal of King David and King Solomon and glorifies, in their eyes, the God of Abraham, Isaac and Jacob. The twelfth fold of the flag, in the eyes of a Christian citizen, represents an emblem of eternity and glorifies, in their eyes, God the Father, the Son, and the Holy Ghost. 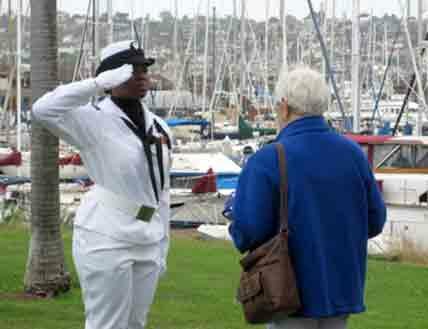 The following images of the Military Honors ceremony were taken by our crew before the family boarded the yacht for the ash scattering at sea. This was a “Full Honors” detail with rifle detail. At the end of the ceremony 3 of the fired rifle shells are presented to the next of kin.